Revenue leakage, clean fraud, fresh fraud, criminal fraud…if you are part of an airline, then you would have probably heard of all of these. But there is one more type of fraud – loyalty fraud - that is now entrenched on this list as well. Yes, loyalty fraud isn’t atypical phenomena anymore. In fact, nothing is more dreadful than the fact airlines, as an industry on the whole, haven’t come to grips with this menace. This is exemplified by the fact that not only hackers, but current employees or ex-staff are also currently indulging in illegitimate activities related to FFPs. Not only there is claiming or awarding of miles fraudulently, but the brand value as well as the trust of the customers takes a beating. A couple of months ago Air India was embroiled in one such controversy. If we type “Air India loyalty” on Google UK or Google India, then on the first page itself there is a news link about theft of passengers’ frequent flyer miles. This means any search about Air India’s loyalty program can have a detrimental impact on the brand, and negative impact on the association of a passenger with the airline or their FFP. “This is completely unacceptable (ex-staff gaining access even after not being associated with the organization),” stated Peter Maeder, Co-Founder & Secretary, LFPA or Loyalty Fraud Prevention Association, a new entity set up to fight loyalty fraud. FFPs worldwide continue to face capacity, regulatory, accounting and liability pressures, notwithstanding the fact that we compete for “share of mind” in an over-crowded loyalty environment. FFPs have evolved, and as a result the earning and redemption options today are more than ever. Maeder says because of the new accounting rules introduced in 2008/ 2009, loyalty program manager are seeking more ways for their customers to redeem their points and miles. “Therefore, cash-like redemption programs are on the increase. As a result, stealing points/ miles have become much more interesting for the criminal fraternity. Furthermore, so called “friendly fraud” - we should not talk about “friendly” fraud , fraud is a criminal act and can’t be friendly! - is very simply done by all people involved in loyalty programs (staff, but also travel agents or other third party organizations),” explained Maeder. Maeder says its imperative airlines comprehend all possibilities of fraud - fraud by members, staff, travel agents, partners, data breaches/ hacks/ malware etc. and accordingly train relevant teams and find ways to forge reliability and security across the organization. “Rather than just dwelling on costly initiatives from the beginning, a solid foundation needs to be in place – enforcing certain values and creating awareness. Airlines owe it to their loyal members – protecting data of passengers, and shield their reputation. This is absolutely mandatory at this juncture,” said Maeder. For example, a tendency to keep simple passwords is still there and this can result in a compromise of any IT system if the staff goes ahead with say “123456” as a password. Fighting fraud requires a professional organization - few airlines have so far invested in developing teams and systems to respond adequately to the rapidly increasing threat, which costs them not only money, but above all their reputation! Does it require media pressure, until the loyalty industry is waking up and starts taking the necessary steps to fight the phenomena?” questioned Maeder. Airlines need to take simple measures first to ascertain the danger of cyber security and gradually move on to embracing high-level risk-based rule engines to monitor accounts for suspicious or unusual activity, and establishing automatic alerts for questionable activities. Hackers, who are usually a step ahead of the “good guys” have started to switch their activities to loyalty programs, which are not as well protected as card programs. Also, the airline industry is working together in fighting card payment fraud – work groups, data sharing, chat forums etc. “Nothing similar is available so far in the loyalty area,” said Maeder, who added that the objective of the LFPA is to provide guidelines, share best practices, offer training and exchange ideas about fighting loyalty fraud. Collaboration is definitely going to be an important weapon in the armoury of airlines. Maeder made an important remark. How efficiently machine learning is coming to grips with blocking fraudulent transactions automatically? And how does it work? As I initiate my conversation with Justin Lie, who has built CashShield, a SaaS based self-learning fraud prevention solution for ecommerce, from scratch, I am eager to know how the industry is trying to combat fraudsters. As this tactic has been around for a while, where do cracks emerge then? Singapore-based Lie, Group CEO, Founder, CashShield, says when we talk of machine learning, it is important to differentiate between the different types of machine learning deployed. Many fraud solutions in the market now tout their use of machine learning, but they are usually only using one form of machine learning – predictive analytics – which allows the solution to predict future fraud based on historical data. So this method of fraud prevention is good, but problems arise when completely new transactions with no historical data are submitted into the system, and there is no way for the machine to predict whether or not the transaction is genuine or fraudulent. “For instance, when a fraudster uses a new program to carry out a fraud attack, there would be no records of the new program, making it difficult for the machine to detect the suspicious behaviour until the fraudulent transactions were accepted and later recorded in the system as fraudulent,” explains Lie. He says to increase the effectiveness of the fraud system, another form of machine learning must be used as well – pattern recognition. “With pattern recognition, even without any prior historical data, the machine is able to detect patterns across different transactions and diagnose if the transaction exhibited bot behaviour or human behaviour,” Lie asserts. Using big data, the system collects information from the merchant’s website, such as the user’s web movement behaviour, social media accounts, likes or comments on the website, e-newsletter subscription or alternative payment methods. Combined with pattern recognition, the system draws patterns (for both positive and negative behaviour) to map the DNA profile of the user, and determine if other incoming transactions exhibit the same (fraudulent) behaviour or not. The large quantity of information collected from big data makes it difficult for fraudsters to cover all of their tracks, therefore increasing the effectiveness of preventing fraud. We also dwelled on what different types of machine learning are there for an apt blend of chargeback protection and fraud prevention. Lie explained: pattern recognition, deep learning and stochastic optimization are also necessary for combining millions of test results to be crunched for an optimized yes or no decision in real time. “Predictive analytics falls under the branches of supervised learning in machine learning, and is important to predict if a fraudster will use the same attack again in the future. However, other forms of machine learning – unsupervised learning – are also important, especially when new attacks with no previous data happen. Unsupervised machine learning is able to seek patterns and correlation amidst the new data collected, which helps to identify positive and negative behaviour, and is effective in identifying genuine customers as much as identifying fraudsters,” he said. He further explained: Statistical modelling provides test results, while probability modelling assigns weighting. When we apply this to fraud screening, using probability modelling only gives you a risk score based on the information collected about the transaction. The merchant still has to rely on a team of manual reviewers to look at the risk score and decide whether or not to accept the transaction. The problem here is that fraud officers are often risk averse and their main KPI is to bring the fraud rate as close to zero as possible, which results in many borderline genuine transactions rejected. Consequently, sales suffer tremendously since many genuine customers are turned away. 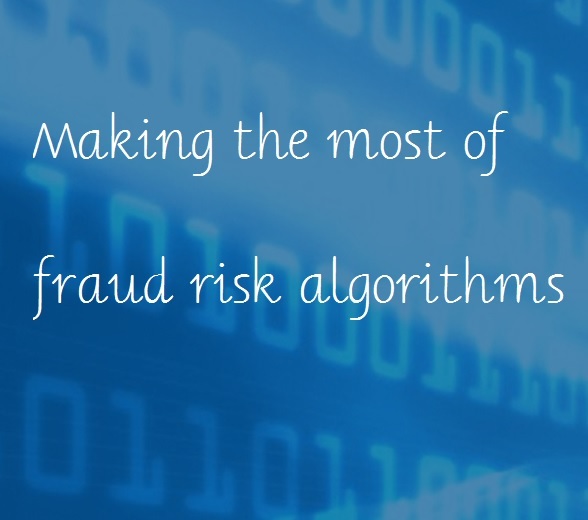 Therefore, it is more useful and effective to rely on an algorithm – what we call an optimized fraud risk management algorithm – to make decisions designed to optimize sales as much as possible while keeping fraud and chargeback rates under control. · The first example: It is not uncommon for a sibling to use another sibling’s online shopping website account to accumulate more loyalty points easily or for the former to use the latter’s accrued loyalty points for discounts. The problem occurs when the former sibling ends up signing in from a different IP address, uses a different device (different device fingerprint) and pays with a different payment account. Immediately, this will be flagged as suspicious behaviour, as it seems like a fraudster is hacking into the user’s account. However, through identity mapping, powered by machine learning, with the algorithm, the machine is able to use data to identify positive behaviour, rather than focus on all the negative behaviour only to pull this genuine customer away from the pool of flagged transactions. · The second example: Small signs may be used to point out signs of fraudulent activity, even if they seem insignificant. Perhaps we have a user who, every time he makes a transaction, will be conscious to unselect the field to subscribe to the merchant’s newsletter. However, a fraudster that has hacked into his account has programmed his attack to select the field to subscribe to the merchant’s newsletter. With small signs like this, the machine is able to see how this fraudulent transaction does not match the user’s purchasing pattern of behaviour, and is therefore able to reject this transaction as fraudulent rather than genuine. Airlines are constantly looking at ways to minimize the impact of chargebacks and one of the topics keenly discussed during the 5th ATPS Asia Pacific was “friendly fraud”. Unlike fraud initiated by a criminal, friendly fraud is the case where a “cardholder” claims fraud for a transaction they were involved in. This type of fraud is hard to deal with as the legitimate cardholder uses the card with all of the correct information, and then disputes the same. What works against airlines and merchants is the fact that chargeback dispute procedure doesn’t support them, as banks and credit card organizations tends to seek only a small amount of proof from customers to corroborate a dispute claim. Speaking here in Kuala Lumpur, Brett Small, Regional Director, APAC – Ethoca, mentioned that friendly fraud refers to “fraud that is committed when an individual had knowledge of and/or was complicit with and/or somehow benefited from the transaction on their own account, although the individual reported the transaction as unauthorized”. Talking of airlines, Small said in case of airlines, friendly fraud is generally the result of buyer’s remorse, additional charges or fees, disagreement with refund rules, and a transaction that is completed by another party. He also explained the spectrum of behavior – varying from a benign one that generally involves a household/ family member (so may be a traveller is on the check-out page on a device, and someone inadvertently clicks to complete the transaction. So the cardholder was unaware of purchase made by a household member. Or as Small said it could be a simple case of just not recognizing the purchase – descriptor issue, statement is confusing, etc.) to the cardholder deliberately abusing the system with the intent to commit fraud. · Difficult to detect at time of purchase. · Issuers usually accept a customer’s assertion. · The chargeback process does not adequately address friendly fraud. · There is no way of collaborating with issuers. · High impact to customers and risk of social media damage. · Time consuming and labour intensive. Explaining how issuers comprehend friendly fraud and the way it can be dealt, Small highlighted that friendly fraud is difficult to distinguish from genuine fraud. · Issuers cannot see what is purchased. · It may involve a dispute with a merchant that issuers are unaware of. · Issuers are under pressure internally and from regulators to believe and refund customers. · Issuers have thousands and sometimes hundreds of thousands of disputes per month. · Issuers ask customers questions to try and validate disputes and also look for repeat disputers. But, cardholders have learnt how to “use” the system. Friendly fraud has raised the overall chargeback level, making acquirers more watchful about accepting risk liability. The industry has been looking at this issue, for instance, Visa last year chose to accept airline-supplied flight manifests as a remedy for fraud payment card chargebacks (when the passenger name matches the cardholder name). As explained by Monica Eaton-Cardone, COO, Chargebacks911, in one of her recent blog posts, initiatives taken such as one taken by Visa are being taken to help fraud-burdened merchants, but still it isn’t a definitive solution. She asserts that savvy consumers continue to exploit loopholes and merchants still report significant losses. She recommends that fraud filters need to work better. Also, merchants need to be sharp enough to understand the buying behavior, and consumers need to understand that their actions have consequences, and that getting involved in friendly fraud is going to have detrimental impact eventually. More specifically, airlines need to look into booking history and any other internal and external data sources to verify travel. Evaluating customers’ chargeback history can be useful, too. “There is a need to leverage merchant historical data - card number + device/ IP address for previous orders. Also, make household profiles and link all their devices. On another note, one may call the cardholder when it makes sense. This is based upon transaction amount, customer relationship, evidence etc,” said Small. “Airlines can look at implementing simple, clear refund policies. But, don’t be too easy as the new trend is refund abuse,” cautioned Small. · Using modified merchant descriptors. · Making change and refund policies clear in the booking flow and post booking communications. As it turns out, completely doing away with chargeback fraud isn’t a possibility, though curtailing the risk of such kind of credit card fraud is possible. Airlines have to count on ways to avert the danger of becoming a victim of friendly fraud. Merchant-issuer collaboration is essential and can play a big role in dealing with such malicious behavior. How is the travel industry dealing with the issue of transactions wrongly declined due to suspected fraud? It is a serious issue as an indifferent customer experience can result in customers cutting down on their card usage or even abandoning it altogether. Yes, merchants are more liable for card-not- present (CNP) transactions today but they also need to be wary of the repercussions of a purchase decline that isn’t a fraudulent one. Of course, the first major impact is the value of the order. Now all the money spent on getting a customer close to completing a transaction is also wasted. So be it for a print ad or remarketing campaign, the cost of acquisition is negatively affected. Then one should also consider the probable lifetime value that is lost when a genuine traveller’s order is erroneously declined. In this context, all stakeholders need to work on apt card authorisation strategies. So when we talk of stakeholders working in tandem, there is a need to constrict your acceptance gap. It is pointed out that there tends to be a gap in acceptance as banks today are more wary of remote/ card not present transactions. Plus, there have been data violations/ incidents of fraud and also merchants have the tendency to deny transactions from particular geographical areas. So by cutting down on this gap, one can benefit by authenticating those transactions, which have a higher likelihood of being authorized. So if we talk of what can be done, there is a need to make the most of what is available. For instance, a travel company I spoke to referred to 3D Secure, and how this offering is different from other payment fraud prevention solutions. 3D Secure’s code is rooted in the authorization message from beginning to end when we consider settlement. This spans multiple parties and servers. One can reap benefits by focusing on troubleshooting and monitoring of the service, and linking various 3rd parties involved. The data elements obtained from the authentication are shared with the issuer. The same enables issuers to amend their authorization risk settings and tie the authorization to the authentication. Issuers who have deployed a risk based authentication mechanism will contest or assess transactions that seem doubtful. This way they can flush out fraudsters and cut down on false-positive declines. So before authorization they can spot danger. Based on the risk level they are then able to challenge the consumer with knowledge based questions or one-time pin numbers sent via SMS. Here it needs to be mentioned that as per the real experience of those of who have benefited from 3D Secure, it is being indicated that the end to end interoperability of 3D Secure eradicates the speculation once associated with CNP commerce. As we learnt from Amtrak, the key to full 3D Secure optimization and effectiveness is to take advantage of the liability shift rule and to front load 3D Secure into your risk model. The company was able to lean on this new found component of the 3D Secure protocols to not only cut fraud but also increase sales. “Issuers have lower decline rates because they have better data across the lifecycle of the card. By giving the issuer the ability to silently interject themselves into the checkout make a risk determinant will allow you to expand your risk systems beyond your walls,” shared a source. As for being realistic, one needs to ensure that the right tools are in place, too. You can't just go to market with a vanilla 3D Secure MPI provider and expect it to work. The fraud problem is boosting the false positive issue. Merchants, acquirers and issuers decline far more good transactions than bad. “No industry is affected more by false-positives than the travel industry,” highlighted one executive. Its true indeed as high ticket items along with the high potential for fraud results in the highest false-positives averages online. So every travel company needs to identify how to implement static rules, ones related to behavior of a user, and also device fingerprinting. Multi-factor authentication is also being counted upon to bring down false positives. For instance, this way one can step up approvals for new account openings, as they say, across thin-file leads with limited credit histories. Some of the options include commonly used one-time passwords (logging on to a network or service using a unique password which can only be used once or 1-time passcode based on the token’s secret to ensure authentication); certificate-based authentication (blends a public and private encryption key unique to each device; context-based authentication (optimizes a layered approach to access security by assessing user login attributes and matching them against pre-defined security policies). Talking of Chip and PIN versions of EMV cards, one needs to be careful as it has both positive and negative sides to it. Airlines need to build trust and strengthen security. Today there are ID checking services available that use online and social media identity data, ID documents and facial biometric checks to prove that a person is who they say they are. Lastly, whatever move is made it needs to be checked minutely. For instance, it is being stressed that one shouldn’t use biometrics in client-server architectures (not suitable for use as a factor in two-factor authentication). This is because credentials are sent over the wire (both LAN/WAN and the Internet). Since such authentication can’t be taken off, it needs to be assessed in which situations it can be potentially compromised. Ai’s Editorial: Is travel figuring prominently in “wearable future”? Where is wearable technology headed? It’s a broad question, but there is a reason behind not jumping on to the utility for the travel sector. The way today’s gadgets are shaping up, we expect them to deliver on multiple counts. So when I use my smartphone and smartwatch (say, paired together the way Apple products are), I expect to press lesser number of tabs (for instance, every time there is an interview scheduled in my email I expect my phone would send me a reminder without me pressing on a calendar tab), send useful notifications (say I have booked a room via an OTA app. On the day of the check-in, when I reach the vicinity of the hotel, I should be guided by my smartphone to reach the hotel) etc. So I am expecting a lot more all the time. Frankly speaking, the lure of using a smartwatch hasn’t increased and it has failed to go beyond simple notifications. There is buzz that speech recognition and text-to-speech is set to improve, but it remains to be seen what is going to happen next. At this stage, simple experiences like third party apps not working on smartwatches seem to be an issue. When usage of apps doesn’t work it is quite frustrating. I am not too savvy, but after reading about the role of a smartwatch, it is clear that data is being tracked with the current generation of wearables. In its list of 10 compelling wearable device experiences over the next two years, Gartner mentioned biometric authentication, mobile health monitoring, virtual personal assistants, smart coaching, virtual and augmented reality, accurate motion recognition etc. The study also added that there is “genuine scope for wearables to create intelligent personalized experiences that really add value”. Overall, in comparison, the travel sector has to catch up. Yes, experts do pick developments such as the Starwood application for Apple Watch (unlocking room door in the hotel by the simple tap of a button) as a positive experience. One can also access stay details, including check-in, checkout and confirmation number, or points. Still it wouldn’t be wrong to say that the travel sector is lagging behind the likes of retail, healthcare and gaming when it comes to the “wearable future”. “We have yet to see the travel industry tap into the “contextual purchase”,” says O’Shaughnessy. He says the entire mobile ecosystem has the potential to eliminate the “point of sale” entirely, leaving staff to focus on customer service in retail, for example. “When it comes to notifications and proximity technology, mobile has the potential to reduce the hustle commonly seen at departure gates. With wearable, this can make the experience even more streamlined, and communication more personalised. On a personal note, I’ve yet to board a European flight smoothly with Passbook on my watch,” shared O’Shaughnessy. What should airlines expect in the future? I spoke to O’Shaughnessy about specific areas. Data, analytics and personalisation: Wearable adds more touch-points to every passenger journey. “Airlines that thrive in this space will also thrive in mobile and next-generation web tools. The critical factors are payment technology, and moving toward account or virtual-account based relationships. The connection with loyalty programmes is open too,” shared O’Shaughnessy. Wearables can bank on being more connected to the user’s physical body than any smartphone or mobile device. Let’s see what the travel industry can bring. May be a chatbot via wearables – say that can guide me to a change in terminal at the airport with clear instructions without looking at the screens or booking a table at a particular restaurant with clear instructions about how far the restaurant is from my gate. Just random thoughts about one aspect of our journey. Risk of data breach: Can my Apple Watch be hacked? There already have been concerns over personal health data being leaked. O’Shaughnessy says so far, this is a marginal risk. As devices become more capable, this may change. Payments: Behind the scenes, the payment industry is changing entirely; when more banks in more markets adopt tokenization, we’ll see the applications first on mobile, second on wearable. Think about smoother, simpler payments, said O’Shaughnessy. There have been developments where companies like the Swiss watchmaker Swatch are gearing up to let consumers take their watch close to contactless terminals enabled for NFC (near field communication) technology, and avail contactless payment service. The IoT (or Internet of Things) future shaped by wearables: Wearables is one aspect of the Mobile or IoT space. As one of the first consumer IoT segments, this will push technology towards “longer battery life” and “better processing power” in order to make products more competitive over time. Kevin O’Shaughnessy is scheduled to speak at the upcoming 5th Airline & Travel Payments Summit Asia-Pacific. It is scheduled to take place next week (17-18 Aug) in Kuala Lumpur. Airlines dread the thought of ending up being a victim of loyalty fraud. Be it for costs associated, poor customer experience or reputation taking a beating, any fraudulent activity can prove to be a strenuous act to cope up with. Loyalty program fraud largely tends to revolve around purchase of points or miles via fraudulent or stolen credit cards, and taking over of loyalty accounts by a cheat/ imposter, who generally redeems the points or miles. Considering the fact that airlines present more earning and redemption options today, mainly via partnerships and rewards ecosystems, this also means that the overall loyalty earning and burning lifecycle has paved way for new means of fraud. As we gear up for Loyalty Fraud Prevention Discussion Group APAC (a complimentary meeting to stop the threat of loyalty fraud), scheduled to take place in Kuala Lumpur (22 August, 2016), we thought of highlighting some of the ways one can mitigate and protect respective programs against this illegitimate exercise. · Monitor activity: Airlines need to assess the possibility of fraud at the point of transaction, including the purchase or redemption of points or miles. Also, as CyberSource recommends, carriers need to shield accounts in their loyalty programs. One needs to identify fraud at account creation and login, and monitor accounts for suspicious activity. It is recommend that one should assess monitor device information throughout the customer lifecycle, from the account opening to account login and transactional activity. · Keeping data/ information secure: Customers hate identify theft, so keeping such data secure is a must. Of course, if airlines fail when it comes to custodial responsibility to secure customer information, the trust factor takes a beating. According to a global study (in December 2015) by a digital security specialist Gemalto, around 64% of people surveyed worldwide are unlikely to shop or do business again with a company that had experienced a breach where financial information was stole​n, and almost half (49%) had the same opinion when it came to data breaches where personal information was stolen. · Stringent verification: There is a need to go beyond conventional passwords and PIN based approach. As highlighted by Visa, biometrics offer “the only way to link” a person’s physical identity to his or her digital identity. Biometric authentication features fingerprints, facial recognition to authenticate one’s identity. This is something that cannot be replicated with ease. · Being savvy with data: Connexions Loyalty asserts that it’s imperative to link data sets with identities, i. e customer loyalty data with customer transactional data, social and digital behavior, demographics etc. · CX shouldn’t be jeopardized: Any measure taken to prevent fraud shouldn’t jeopardize the customer experience. Stronger collaboration is required, with fraud prevention, IT and marketing interacting regularly to ensure a loyal customer is offered a superlative experience. · Create awareness: I generally don’t even access my loyalty account till it’s time to redeem an award. Does this give a fraudster a window to act? Airlines need to inform their loyalty program members to be more vigilant, share information about breaches and the significance of setting new password from time to time. Overall, airlines need to look at a meticulous fraud initiative that is fit for particular needs, featuring real-time monitoring method, including analytics, scoring, device data, product based rules, behavioural monitoring, and geographic analysis. Its time airlines make the most of machine-learning and rules-based systems to combat this malice. Taking a look at the bigger picture, online fraud is a massive issuer. According to an initiative taken by the Europol in June, an international law enforcement operation targeting airline fraudsters resulted in the detention and investigation of 140 individuals found in possession of tickets bought using stolen or fake credit card details. Those arrested during the operation “were also found to be involved in other forms of crimes, including human trafficking, drug trafficking, cybercrime and terrorism”. Talking of rewards fraud detection and prevention, it definitely calls for a long-term plan. Balancing security, revenue optimization and above all no comprise in delivering a desired customer experience is a must. Ai is scheduled to conduct the Loyalty Fraud Prevention Discussion Group APAC, a complimentary meeting to stop the threat of loyalty fraud, in Kuala Lumpur (22 August, 2016). Ai Video: Chatbots – finally taking off?